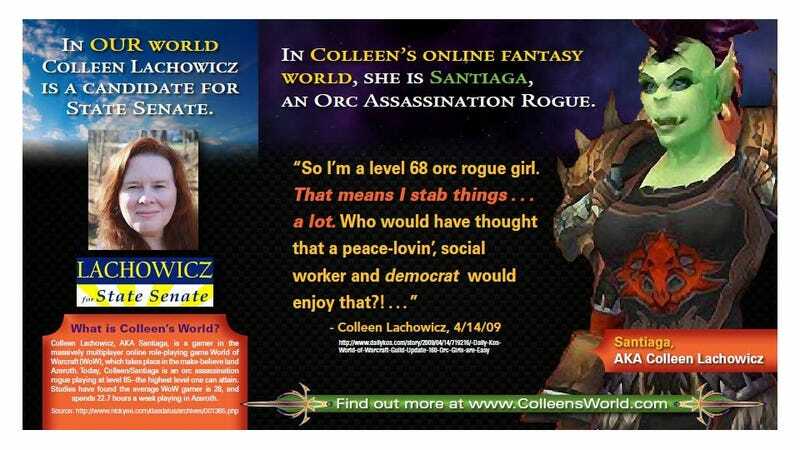 The Republicans in Maine State Senate District 25 are outraged about the World of Warcraft playing ways of Dem candidate Colleen Lachowicz. In fact, they've gone so far as to create a website, hilariously named Colleen's World, to detail her video game sins. Colleen Lachowicz, the Democratic candidate for State Senate District 25 (Waterville), has been living a time-consuming double life as a member of the World of Warcraft community. World of Warcraft is an online gaming network where people play a fantasy role-playing game in an imaginary world called "Azeroth." Seriously, you guys? First off, Republican incumbent Thomas H. Martin, is a paintball player. WAY WORSE. Secondly, she is just a nerdburger who is unwinding from a stressful day with some good clean ogre fun in Azeroth. Thirdly, we should be impressed with her level in the game! She's reached the top, you guys. That takes dedication, perseverance, and social skills, all of which are essential for a good stateswoman. If she can rock it so hard in the virtual world, think of what she's capable of IRL. Some videos games even appear to sharpen scientific thinking skills. Researchers at the University of Wisconsin at Madison looked at a random sample of 2,000 chat room posts about "World of Warcraft" to see what the players were discussing. The game is set in a fantasy world where players hunt, gather and battle to move their characters to higher levels. Players who work together succeed faster. The research found the game encouraged scientific thinking, like using systems and models for understanding situations and using math and testing to investigate problems. Action video game players' brains are more efficient collectors of visual and auditory information, and therefore arrive at the necessary threshold of information they need to make a decision much faster than non gamers, the researchers found. Now, don't you want someone that can make quick, solid decisions? No pussyfooters in office! That's what I always say.